Officials closed beaches along the South Shore and a probe is focusing on what bit the two victims, who were injured at the Sailors Haven and Atlantique beaches. This story was reported by Laura Blasey, Robert Brodsky, Stefanie Dazio, Kadia Goba, Michael O’Keeffe and Ellen Yan. It was written by Yan. Two children playing in ocean waters off Fire Island were bitten on the leg Wednesday in a pair of suspected shark attacks that shut down several South Shore beaches to swimming and prompted the governor to launch an investigation, officials said. The incidents, involving a 12-year-old girl and a 13-year-old boy, occurred within about 15 minutes and less than five miles apart. The first attack happened around 11:15 a.m. at the Sailors Haven beach, the second at Atlantique beach, officials said. 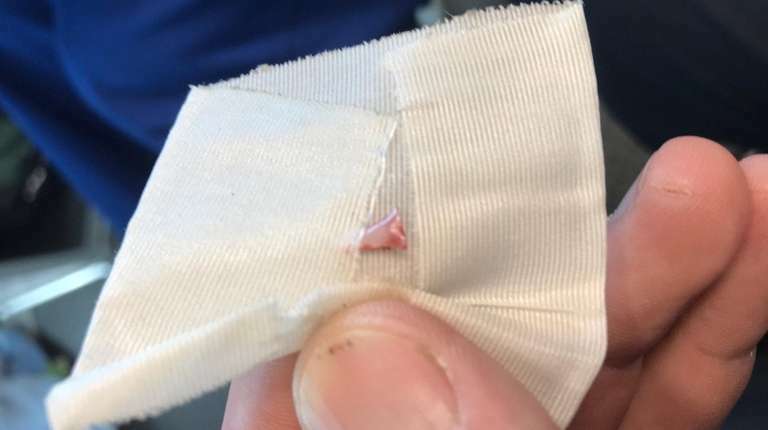 Rescuers extracted a tooth from the wounds of the boy, who remained at Southside Hospital in Bay Shore Wednesday night with non-life-threatening injuries, authorities said. The girl was treated and released from Good Samaritan Hospital Medical Center in West Islip. DEC experts were to examine the tooth to determine if it came from a shark. The first victim, Lola Pollina of Islip, said she was in the water when she felt “a quick pull” and saw a fin and a whirlpool. She tried to get out. Lola said the wounds looked more like scratches than a bite. She did not get stitches. “I thought it was a shark because, like, we were at the beach and it’s not like it would be a tiger or something," she said. Dr. Kathleen O’Hara, a trauma physician, said the wounds were “fairly superficial,” more like the animal ripped the flesh rather than grabbed onto the leg. Just before 11:30 a.m., the second victim, who was participating in a kids' day camp, was carried out of the water with more serious wounds by an Islip Town lifeguard, who noticed him struggling about 10 yards offshore and carried him back onto the beach, town officials said. "He told me he felt like he was bit by something, and when we cleaned off the blood, we realized there were bite marks on his leg," said Bella Coan, 17. "He had bite marks on his upper thigh to his calf. He had about three one-inch incisions in his leg." She said the boy was "brave" and calm, trusting in the lifeguards who cleaned his wounds and took out a tiny tooth from his punctured skin before Ocean Beach EMTS arrived to dress the injuries. But parents of other campers expressed concern that they were not notified of the incident. “We interacted with the children but there was no official word from the camp,” said Peter McCann, 48, of West Islip. He said his 13-year-old daughter texted him to say someone had been bitten. Islip Town Supervisor Angie Carpenter apologized at a news conference Wednesday. She said going forward, parents would be alerted if "there is an incident they should be aware of." Town of Islip ocean beaches were closed for the rest of the day Wednesday. Officials said they would reassess the situation Thursday morning. Robert Moses State Park and Babylon Town beaches were also closed for a few hours. State Park Police sent a drone over the ocean at Robert Moses to try to find a shark that had been reported, but nothing was found. Fire Island National Seashore beaches were closed until further notice, a spokeswoman said. Two sharks were caught late Wednesday afternoon, one in Kismet on Fire Island and the other 50 yards east of Atlantique, Islip Town spokeswoman Caroline Smith said. There was no indication that either was involved in the attacks. DEC officials said they are working with the state parks department, Suffolk County and other agencies in the investigation to ensure proper precautions are taken to reduce potential conflicts with sharks. It is likely the sharks were chasing prey near shore, because it’s common for sharks to be off the Long Island coast this time of year, they said. Sharks and large fish are a part of Long Island’s marine ecosystem. Researchers have found nurseries for sand tiger and great white sharks off the South Shore and the state Department of Environmental Conservation and the National Oceanic and Atmospheric Administration continue to monitor populations of dusky and sandbar sharks, among other species. However, attacks on swimmers are uncommon. Carpenter called the incidents “unusual” and said she notified other ocean-facing towns of the attacks. Philip Pollina, Lola’s father, said he and his family took the ferry to Sailors Haven for a day at the beach and Lola waded into the water for a swim with her brother. It was the first time the family had visited Sailors Haven. He said his wife Barbara Pollina was watching closely because she was nervous about their 5-year-old son playing in the surf. But then they heard a scream from Lola, who was standing in waist-deep water. Pollina said the lifeguards came over to examine Lola’s injuries. Even as lifeguards bandaged Lola’s leg, Pollina said the water was filled with swimmers. Casey Murphy, 18, of Wantagh, was vacationing at Kismet when beachgoers got word of a possible shark attack. With the beach closed to swimming, he said he turned to fishing for stripers or bluefish after 3 p.m., using bunker as bait. “Fifteen minutes in, a shark took the bait and I reeled it in,” Murphy said. Suddenly, a crowd of more than 100 swelled around him as he reeled the shark – which he said he thinks is a sand tiger shark that weighed 80 to 90 pounds and was as much as 6 feet long – onto the shore. Several of the common shark species including sand tiger sharks are protected and under state law, it is illegal to fish for them. Sand tiger sharks, sandbar sharks and thresher sharks are common in Long Island waters during the summer, said Tobey Curtis, a NOAA shark researcher. Juvenile sharks spend the warmer summer months chasing schools of bunker fish before they grow large enough to swim farther out into the Atlantic. Often, these schools bring them closer into shore and Curtis said ocean swimmers may not even be aware of the young sharks swimming around them. Bites are usually the result of an arm or a leg getting in the way of a feeding shark, he said. Bluefish are also known to chase the same bunker schools and bite humans, though their bites are just as rare. Curtis examined photos of one of the victims’ injuries and said they were more consistent with a bite from a smaller shark than a bluefish. Lola said she won’t be deterred, whatever attacked her. She says she’ll be ready to play soccer when the season starts in the fall.